If your young child is behaving in a way that is oppositional or defiant, you’ve probably heard one or more of these phrases from family, friends, teachers or the lady in line behind you at the grocery store. People are often well-intentioned (or sometimes just plain nosy) and quick to dispense advice on how to handle behavior problems with your child. 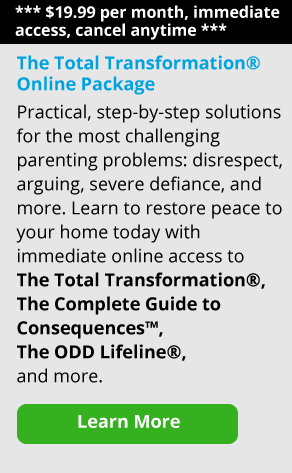 But what about when your child is behaving in a way that is clearly beyond what most of us would call “typical?” How do you know if his behavior has moved into Oppositional Defiant Disorder? How young is too young to diagnose ODD? 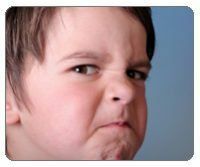 Tantrums, low frustration tolerance, and the “gimme’s” are all typical in children, especially 2-7 year olds. Kids want what they want, when they want it. When faced with the word “no”—or any type of frustration—they will often have a hard time expressing that frustration in what we would call a “positive” manner. That’s part of being a kid. But over the years, many parents have told us things like, “I knew my son was different from the time he was two. He just reacted more strongly to everything than most kids. He would get really upset and angry, and it seemed like it happened all the time.” The difference between your “typical” young child and one who is acting in a pattern of oppositional-defiance lies in the intensity and frequency of the behavior. ODD behavior can be a pattern of screaming and throwing things, or it may be outright refusal to follow your rules or directions. You ask your child to brush his teeth and he is just not going to do it—no matter what you say or do. If it seems more severe than typical behavior, it probably is. It’s always a good idea to speak to your child’s pediatrician when you have concerns like this. They will be able to tell you if the behavior is typical and age-appropriate. 1.Try not to be afraid. It can be very frightening when your child begins behaving in a way that is oppositional and defiant. You ask yourself, “Why is this happening? Am I doing something wrong as a parent? What if I don’t fix this before she gets older—adolescence will be horrible!” Before you know it, you’re picturing your child at age 16, breaking all the rules, completely out of control and hating you. If your child is showing signs of ODD, even at the age of two, she’s showing you that she has the type of personality that will push limits. As hard as it may be, try not to predict the future, or blame yourself or your child. When you do this, emotion can take over and parents end up reacting to their child’s behavior out of fear, desperation or determination to “get it under control now before it gets even more out of hand.” Instead, stay in the moment and focus on the behavior you’re seeing right now. 2. Don’t get too hung up on a diagnosis. Is it helpful to know that your child has ODD? It can be. It can help you understand why “typical” parenting approaches usually aren’t successful with your child. It can help you understand your child’s personality and how it relates to his behavior. ODD can go hand-in-hand with another diagnosis, such as ADHD or Asperger’s Disorder. It’s helpful to know if your child is experiencing these things as well, so you can understand if there’s something else going on that’s contributing to the ODD behavior. You may find out that your child has trouble focusing and sitting still, so when he’s asked to do so he fights against it. You may choose to schedule your child with a psychiatrist or child therapist for an evaluation to see if there are any other underlying clinical issues that he is struggling with. But remember: a diagnosis is just a framework for looking at a set of behaviors. No matter what’s going on that’s leading to the behavior, your job is the same: to help teach your child what the limits are in your home and how to follow them. 3. Look at this as a prime parenting opportunity. Life is full of limits, boundaries and consequences—for children and adults. When your child is young, even if he’s engaging in some pretty tough behaviors, it’s an excellent opportunity for him to begin learning those lessons on boundaries and limits. These life lessons begin in your home. As a parent, you are your child’s first “authority figure.” When you respond to his behavior, you are essentially saying, “This is the line, right here, and when you cross it, this is what will happen. Every time.” You’re preparing your child, from a young age, for what it means to have boundaries. You’re also preparing him for what to expect from you—his parent and authority figure—every time he crosses those boundaries. Down the road, he will have other authority figures (teachers, coaches, bosses, etc.). He may or may not change his tendency to fight against limits as he gets older. But he will always know what to expect because you’ve laid the groundwork. 4. Make consequences immediate and fair. Make a list of your child’s behaviors that you want to target. Review the list and determine if any of those behaviors have natural or social consequences. For example, if your child is arguing and refusing to go to bed and you know she’ll be tired the next day, that’s a natural consequence. It’s also an example of a life lesson: many adults choose to stay up late even though they know they’ll be tired the next day. Only you can decide which behaviors you are able to let go of—for now—in order to focus on the most serious concerns. Identify one behavior from your list that you consider a priority to address. Pick just one problem behavior to start with. This will be your child’s target behavior. When you are successfully managing the behavior, you can pick another thing to work on from your list. Make a list of potential consequences to use with your child. Consequences should be time-specific (Decide how long it will last—a few minutes, hours or days. For younger children, shorter consequences tend to work better.) and immediate. It helps to tie the consequence to the behavior if you can. (“If you throw your toy, you lose it for an hour.”) Choose which consequence you will give for each target behavior—one you can remain consistent and follow through with. Talk ahead of time. Even though your child is young, talk with him clearly and briefly ahead of time, when he’s calm, about what will happen as a consequence for the behaviors you’ve chosen. This will help him know what to expect. Then stick with it to the best of your ability. Parenting is the hardest job out there. Sometimes it’s difficult to “see the forest for the trees” and some days may seem like a battle more than a relationship with your child. If a child doesn’t change his behavior in response to the consequences a parent gives, it can seem like what you’re doing isn’t working. That’s not necessarily the case. In fact, what you’re doing is working. You’re teaching your child that when he behaves in a way that is unacceptable or inappropriate, an uncomfortable consequence will follow. That’s a life lesson. ODD kids tend to learn and do everything the hard way. That strong will can serve them well in the long run. Life is a marathon, not a sprint. By following these steps, you are showing your child how he can effectively navigate his way in this world. In today’s world, with so much information out there on parenting, we’re taking our job very seriously as parents. Sometimes, we get so wrapped up in trying to figure out why our child is acting in a particular way, we get sidetracked from addressing the behavior itself. Kids act up. That’s their job. Our job is to show our child ways to effectively handle frustration and emotions, and provide discipline until he gains self-discipline. These are the life lessons that your child will take with him into the world, regardless of how he is behaving today.